Sealing heating/cooling ducts can dramatically improve the efficiency of a heating distribution system. Unsealed ducts typically leak about 10 to 15 percent of the conditioned air flowing through the ducts. Leaky ducts can pull unwanted air into the conditioned parts of your house and create pressure differentials within the house, exacerbating air infiltration and exfltration problems. Mastic is a fibrous adhesive sealant used for the coating of thermal insulation on pipes and ducts, and for the sealing of un-insulated ducts. It may be applied out of a bucket with a putty knife. The buckets are resealable, with a vapor lock seal lid. The tube is for use with a caulk gun. 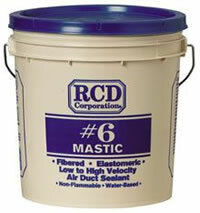 Mastic is non-toxic, non-flammable, and dries to the touch in 30 minutes. Building Components that reduce heating and cooling loads. Blocks introduction, development, or spread of indoor contaminants. Important Note:We cannot accept returns or issue credit for this product.